There are new updates released every day for many Samsung devices, but usually these are just minor ones bringing bug fixes and small improvements. Rarely we see an update from a 4.1 version to a 4.2 or 4.3 version. Luckily, it seems that Galaxy S4 was a lucky one this month as it received Android 4.3 in many countries already. We also have proof of Android 4.3 heading towards Galaxy S3 and Note 2 in November. As usual, updates can be installed using Samsung Kies or with OTA (over-the-air). However, there are some owners that just don’t have the patience to wait until an official update is released. 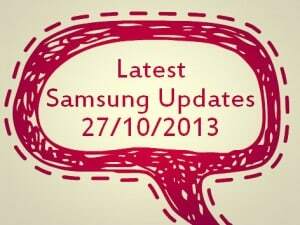 That’s why we are providing you with the download links for most major updates released for Samsung devices. After that, you only have to follow the steps on the tutorial about installing an official firmware using ODIN. Be careful to only install firmwares that were released for your specific phone model and also remember to backup all your files before doing so. Without any further introductions, here are the latest Samsung Updates released in the past week. You can find firmware information and the download link for each update. If you see your country listed there, then it means you can use Kies to update your device. Stay close for more Samsung Updates and news about your favorite devices!